Police data analyzed by the I-Team show a spike last year in the number of people cited for smoking marijuana in public. 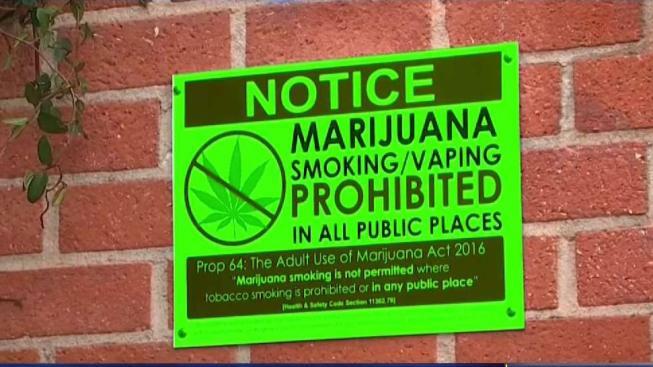 Smoking or vaping marijuana is not allowed in public, but walking around Southern California these days it can be hard to tell. People are seemingly lighting up in public everywhere — in many cases — probably unaware it's illegal. It's an issue that's drawing complaints from apartment renters and homeowners, and the business community. Fifun Amini the owner of a Quiznos in Sun Valley, recently put up no-smoking marijuana signs, saying he wants his customers to have a smoke-free experience. "It's nice to sit down outside, have fresh air and have something to eat," he said. Public places are off limits to use marijuana, which includes near schools, restaurants, parks, shops and inside cars or boats, even if you're a passenger. Common areas in multiunit buildings or even a balcony are also off-limits if other residents can smell marijuana. Bruce Margolin, of LA Norml, a group that promotes the safe, adult use of marijuana, says the restrictions are especially difficult for those who take the drug for medicinal purposes. "It's unfair and unjust," he said. Added Margolin's colleague, Roseann Boffa: "You can go into a bar and drink alcohol, and we know the situations and problems with alcohol, why wouldn't you be able to do it with cannabis?" For now, you can't and the LAPD is cracking down. Police data analyzed by the I-Team show a spike last year in the number of people cited for smoking marijuana in public. There can be various reasons for the increase, but the LAPD says many residents are unfamiliar with laws related to cannabis. "I like to joke about it," Margolin said. "You come to California for vacation, you go home on probation." It's not a probationary offense, but it is a $100 fine, he adds. LA Norml wants to see the city establish more legal places where people can smoke weed, like the consumption lounges in other cities. The city of Los Angeles says it does not authorize or license cannabis consumption spaces. In West Hollywood, though, cannabis consumption spaces could soon pop up if business licenses are approved. WeHo recently OK'd plans to open as many as eight consumption lounges and eight more for edibles only. Advocates say the permitting process to open licensed rooms for smoking marijuana is too slow. LA city Department of Cannabis Regulation officials say they along with the city planning department are preparing recommendations for licensing consumption spaces. The City Council is expected to consider them later this year. For more on the regulations regarding cannabis across the state, click here.